I hope you had a chance to read something Montgomery wrote this month. If you did and wrote up a post sharing your reading experiences, please leave a link to your review/thoughts in the comment section below. If you didn't write a post but read along with us, please still let us know which titles you enjoyed and what you thought of them in the comment section. 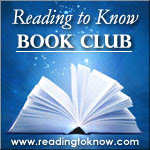 Note: By concluding the LMM Reading Challenge we are also concluding the Reading to Know Book Club January discussion. This month's pick was one title of your choosing by L.M. Montgomery (convenient that!) and so we manage two things at once. Lovely. We'll kick off February's read tomorrow so stay tuned for that. In the meantime, I'm looking forward to hearing about your visit with Montgomery and her characters! Leave a note below for us to visit! http://www.thissimplehome.com/2013/01/pat-of-silver-bush-by-lm-montgomery.html for my thoughts on Pat of Silver Bush. I am currently reading about Pat all grown up in Mistress Pat. She is so sweet! I am certainly enjoying her. I also watched Anne of GG and listened to the book on audio. Marilla really struck me as a wise woman...and so very kind and loving-in her way in the book this year. Thanks for hosting this once again! I always enjoy it but I really enjoyed exploring some new-to-me LMM territory this time. Looking forward to February. I liked your Pat reviews. Now I want to read those! I wanted to read the first two Anne books but only read the first. I started The Golden Road but realized it wasn't the first book in a series. Oops! I hope to read more Anne throughout the year. I am almost done with Anne of the Island but I wrapped up the month anyway. Thanks for introducing me to LMM! I have enjoyed her very much! Thanks for hosting this. I alway enjoy reading Montgomery. I am fairly new to the world of book blogging (I'm hoping to start up my blog in June). This reading challenge is right up my alley! I love L.M. Montgomery. Is this a challenge that happens every year? Where can I find more information about it? I would love to participate next year! Also! Here's the link to Emily D.'s post on why she doesn't like Anne (anymore or ever). ;) There's always one! REALLY enjoyed this charming book!! It sounds like that was a popular title this year! Maybe it will grow on me in time, but I wouldn't rank it as a favorite yet. Finally...my thoughts on The Story Girl.